Part of the Forge Motorsport Hi-Flow range. Increases air flow and improves efficiency and performance. Up to 10 BHP gain. Strong, tight carbon fibre weave. Made from 100% carbon fibre with no fibre glass added. Formed by Autoclave Pre Preg. High flow cleanable airfilter with no need to ever replace. Carbon intake for the VW Golf MK7 GTE and Seat Leon and other 1.4 TSIs. This is the second product to be released in our new Hi-Flow range. With this unique sleek design, you can expect to see a carbon fibre housing that flows beautifully along the engine bay, giving you more horse power and torque, and hopefully an appreciation for the care and time that has gone into the production. It includes a billet machined coupler made to exact tolerances at our machine shop in Gloucester, UK, ensuring a perfect fit. The hose is available in red, blue or black and is supplied with all necessary hose clamps. Following the success of our carbon fibre intake for the Mk7 Golf we knew that we wanted to continue with our Hi-Flow range and bring out an affordable option to the 1.4 TSI market. We conducted intense market research, speaking to tuners and owners of the vehicles we wanted the intake to fit. We concluded that rather than creating an entire carbon fibre intake system, the best product to create would be a carbon fibre scoop and airbox lid that fits with original airbox. With this idea in mind we started the design. Using industrial foam and aluminium the concept design was created. With these components, we could identify the best way to fit the scoop, join it to the air box and mount it to the vehicle. Once the first concept was completed our engineers used the latest technology to create a 3D rendering of how we wanted the intake to look. Throughout the drawing process we ran simulated air flow tests, this way we could ensure that we would create a product with the most efficient flow possible. The carbon fibre prototype was made and fitted to the vehicle. The design is one of the most aesthetically pleasing and practical on the market. To ensure we deliver the best quality product we could and following the extensive design and development of this intake, we enlisted the services of one the worlds leading Carbon fibre manufacturers, whos products range from F1 aero, carbon fibre car bodies and aircraft wings! Tooling was then CNC machined from billet aluminium to ensure the finished product was flawless. This enables us to create a perfect airbox using the autoclave technique during the manufacturing process of the 2x2 twill carbon fibre. Rather than using a vacuum (also known as liquid infusion) to draw the resin through the mould then pulling the raw carbon fibre cloth to the mould shape, a technique known as Autoclave is used in the manufacturing of this beautifully designed product. This involves the use of up to 10 bar of pressure that is blown into a 100% billet mould to force it out. This high amount of pressure ensures the material is fully in contact with the surface of the mould. Therefore, making sure the weave is tight, solid and strong, this process also ensures there are no imperfections in the product. The mould is then heated to cure the resin which in turn gives a tensile strength up to eight times stronger than mild steel but at a fraction of the weight. Having spent so much time on the carbon and silicone development we then turned to the equally important aspect of filtration. With the lid and scoop design completed we moved on to the hose and filter. There is no point creating such an efficient system for it then to be restricted by the OEM hose and filter. Therefore, for the filter we engaged our partners and experts in Filtration Control, Pipercross! With over 25 years experience in both the domestic and motorsport market they recommended a multi-layer foam construction filter, these filters work perfectly in our Hi-Flow range. The large filter provided, flows 30% more air than stock and fits snuggly within the housing. This combination is second to none. The Forge Motorsport high flow intake hose that is mated to the carbon airbox eliminates the highly restrictive plastic and noise restricting inlet pipe, and replaces it with our smooth bore multi-ply silicone hose which increases air flow, improving efficiency and performance. This equates to increases of up to 10hp which is a remarkable gain for an easy to fit bolt on modification. The Forge silicone hose in this kit has been designed to include an expensive inner liner of modified silicone known as Fluorosilicone. 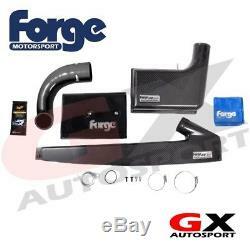 1x Forge Motorsport Hi-Flow, carbon fibre airbox lid. 1x Forge Motorsport Hi-Flow, carbon fibre front scoop. 1x Meguiars care pouch and Forge Motorsport Micro Fibre Cloth. 1x larger bore high flow Silicone hose. 1x USB with installation instructions. Image for illustration purpose only. Please Note: In line with Forge Motorsport's policy to constantly review, revise and improve their product range, the product you receive may differ from the one advertised. NOTE: This product comes with the above options, please leave us a message at checkout to notify us your choices. Forge Motorsport was founded in 1996 with the simple ideals of innovation, clever design, and manufacturing to the highest quality. Their mantra is the BEST customer care and after service worldwide. In doing this, they have developed the largest range of replacement aftermarket valves, intercoolers, and actuators in the world. Utilising a state of the art in house CNC machine shop, and a highly skilled team of dedicated engineers and fabricators, proudly stating'Made In Great Britain' on all products. With all this knowledge at their disposal, they are honoured to supply the leading names and race teams in the world of Motorsport including: F1, WRC, Rally X, and Le Mans. They also supply several OEM manufacturers. With a lifetime customer service on all their products with a no hassle service promise. If you have found this item cheaper elsewhere. Please do not hesitate to get in touch with us, in most cases, we are able to beat the price for you! The item "FMINDK14 Forge Motorsport Seat Leon 1.4Tsi 15on 150BHP High Flow Carbon Intake" is in sale since Thursday, May 24, 2018. This item is in the category "Vehicle Parts & Accessories\Car Tuning & Styling\Engine, Tuning & Chips\Other Engine Tuning".